In his first Mass since becoming bishop of the Diocese of Baton Rouge, Bishop Michael G. Duca appeared relaxed, jovial and calm. The celebration was the 4:30 p.m. Saturday Mass at St. John the Baptist Church in Brusly for the 20 seminarians studying for the diocese. The Mass was on the calendar for Aug. 25 for Bishop Emeritus Robert W. Muench long before the appointment of Bishop Duca. But, when the new bishop learned the seminarian Mass was scheduled the day after his installation ceremony, he did not reschedule. 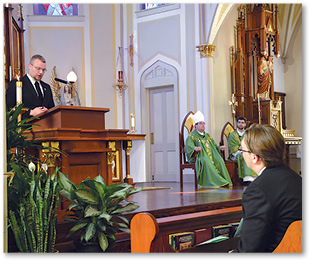 Bishop Duca began his homily with a reminder of how new he is to the job. The bishop talked about Jesus’ Eucharistic discourse, based on the Gospel reading in St. John, and how Jesus did not back down even when some of his disciples left because of the graphic nature of what Jesus was talking about. “Now, I want to make a point that certainly most of us here would have no problem obviously, if Jesus were to say, ‘Do you want to leave, too?’ ‘No, Lord – we believe in the Eucharist. We believe this is the body and blood of Christ,’ ” said the bishop. The bishop then talked about how difficult forgiveness can be even saying that some who cannot forgive will justify it by saying, “I can’t forgive them and I’m okay because God understands,” he added. “That’s what you call self-righteousness,” said Bishop Duca. He then compared the unwillingness to forgive, addictions and other behaviors that are wrong to turning away from Jesus. The bishop said someone once told him, “Father, if I have to forgive that person, it’ll kill me.” In the past, he would let it go, said Bishop Duca, but now he agrees. Following the Mass, Bishop Duca had dinner with the seminarians, giving him and the seminarians a chance to get to know one another.